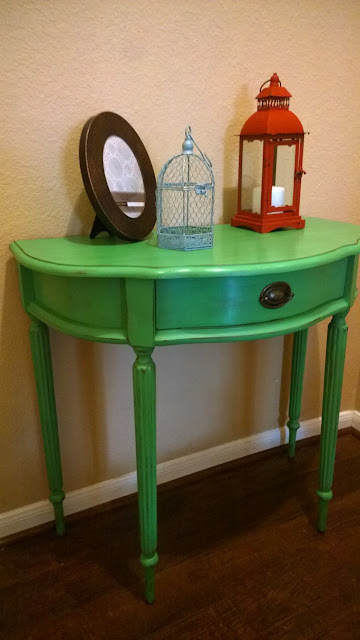 This green Bombay table has always been a favorite of mine, so when I received a request for a tutorial I was definitely happy to oblige! 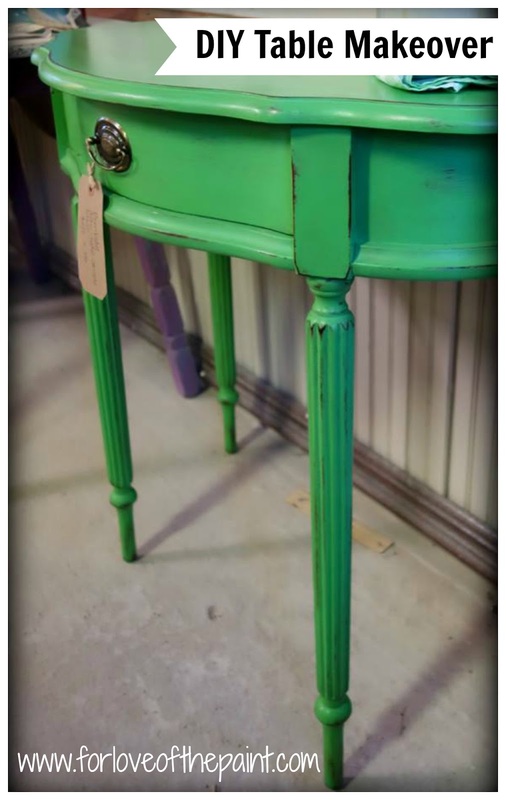 The Bombay company style of console table I love has long, lean legs with gorgeous fluting that I knew I wanted to accent with bold color and a little distressing.. or as I say, a little bit of shabby and a lot bit of chic! Thanks to Jessica at LoveFifty50 and Red Door Lane for the photo in the shop! 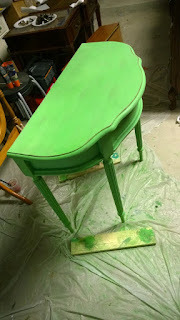 You may remember this table from the Color Story : Inspiration series in-progress HERE. I am positively obsessed with color and knew I wanted to try and capture this vibrant leafy green, but in a subtle, natural way. No big deal ;) . 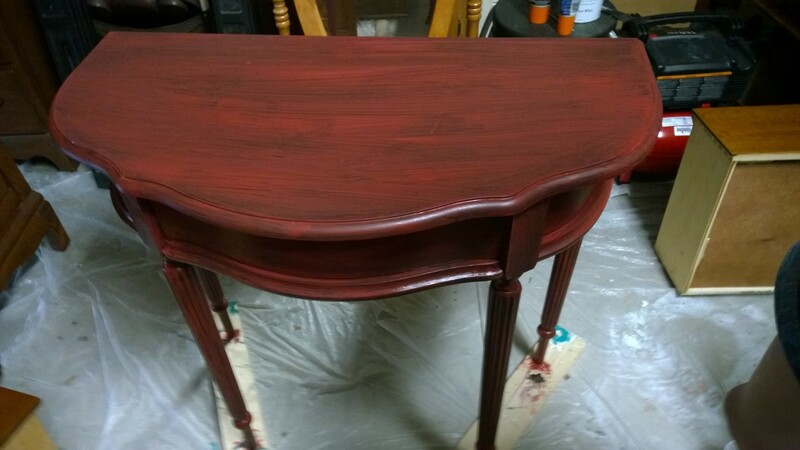 As you can see, the surface was super shiny and slick, so I used a liquid sander/deglosser to help make sure the paint adhered. Another option is to take a fine grade sandpaper over it. Since I knew I wanted to distress down to a reddish / coppery color, I started building those layers. The first coat was done with a cherry cola color. I really wanted to give a lot of dimensionality, so I used a subtle copper metallic by Martha Stewart Interiors (which I'm sad to say, Home Depot has now discontinued, at least in our area!). Then the green. And it was BRIGHT! 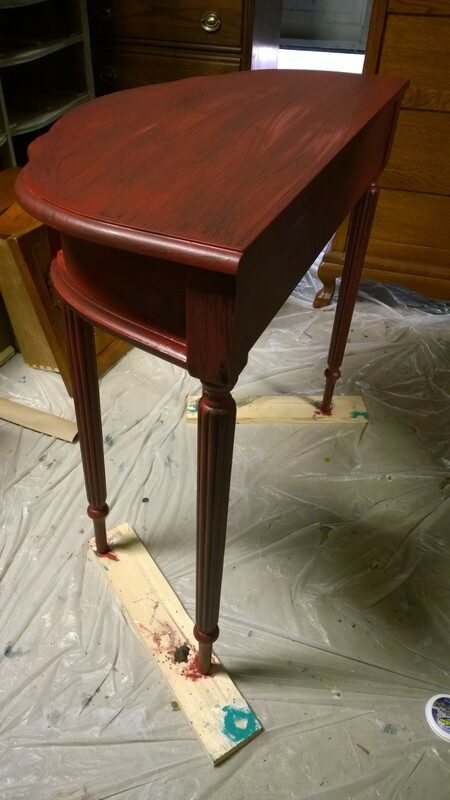 I've used enough chalk paints in my life to not be too scared of the neon look (like I was when I saw the pinkish hue in Primer Red before waxing). I distressed down to pull out the copper and reddish tones, highlighting the high point relief and fluting. 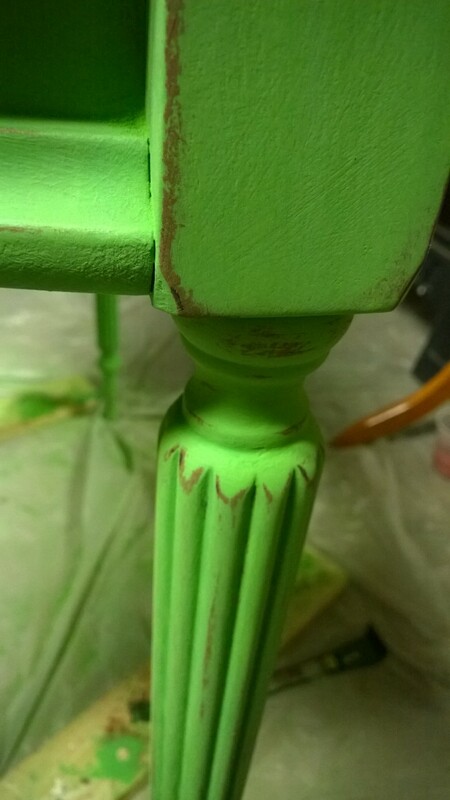 Clear and dark waxes sealed the finish and gave a deep, intense, more rustic green. 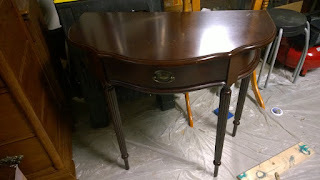 You always want to put on the clear wax first - this will intensify the color by itself. Once you wipe off the excess, the dark wax goes on. DON'T put the dark wax directly on the green paint without clear wax - it will stain the paint super dark! A little dark wax goes a long way, too! I'm still working on my first can a year later. Whenever possible, I like to use the original hardware - it gives a neutral grounding, and a nod to the history and original appearance of the piece, even when it's beginning a new chapter in its color legacy! 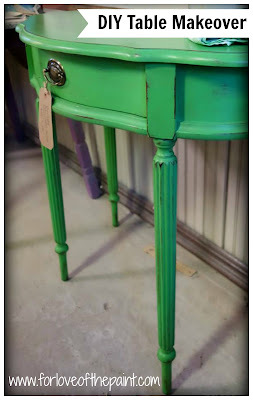 I just adore this table's finish and am looking around my inventory to see what else can go green! 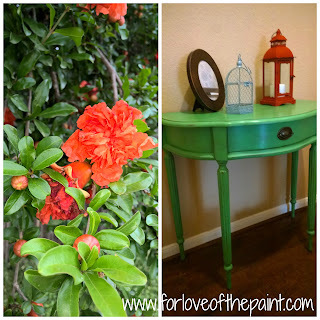 I'd love to see your favorite bold color refinishes, especially if you follow this Antibes makeover tutorial! 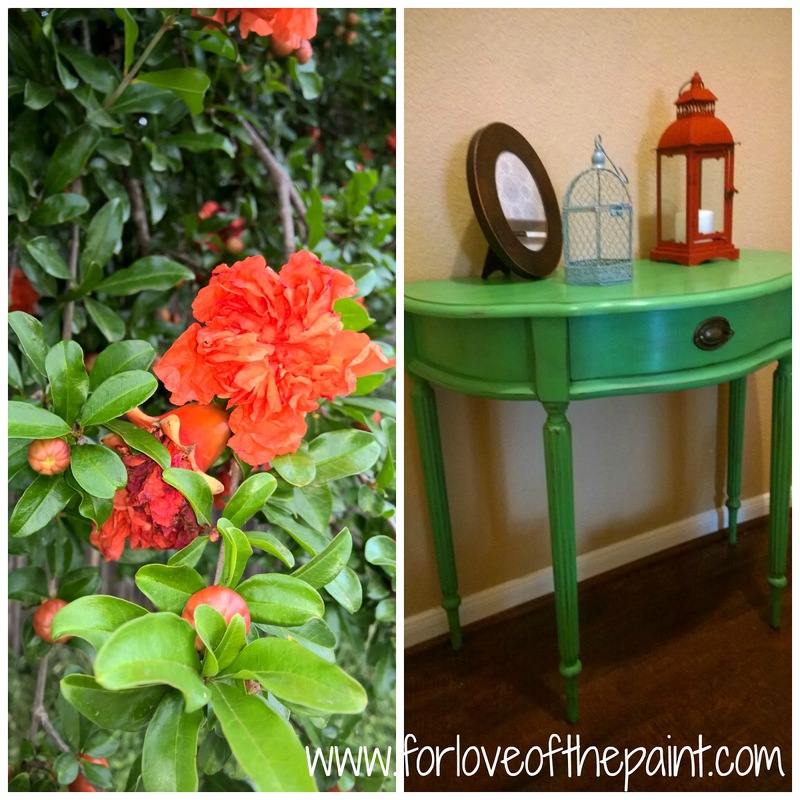 Email me photos at forloveofthepaint@gmail.com and I will be honored to feature them!